"This book gives you many action-oriented ways of coping with your anxiety about anxiety." -Albert Ellis, PhD, President, Albert Ellis Institute Is your job tying your stomach in knots? Do you toss and turn in bed at night? Are your ulcers having ulcers? Face it-you've got too much stress in your life, and it's time to give yourself a break. The consequences of not dealing with stress range from poor health and broken marriages to premature death: not a very cheerful outlook. Thankfully, all kinds of stress reduction approaches are available today: from breathing and posture to imagery and meditation. These new ideas have taken the world by storm-and taken the pressure cooker off the fire for millions of chilled-out people around the world. Whether it's love, work, family, or something else that's got your anxiety in the red zone, here's an easy way to improve your outlook. 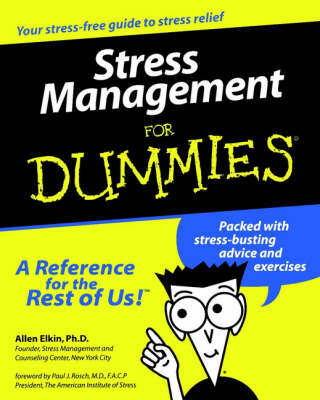 Stress Management For Dummies will help you identify the stress triggers in your life and cut them down to size quickly, with tips on how to: *Determine your stress level *Relieve tension at work and at home *Deal with difficult people *Combat stress with diet and exercise *Soothe your anger and worry Certified stress manager Allen Elkin, PhD takes the guesswork (and the added stress!) out of finding the stress relief system that's right for you. After determining your stress level with a few simple tests, you'll get step-by-step guidance on finding and eliminating sources of stress, in both your mind and body. Inside are hassle-free techniques, helpful advice, self-evaluation quizzes, and fascinating information on: *Letting go of tension through breathing, stretching, massage, and more *Clearing the clutter in your life-and in your mind *Managing your time-setting priorities, delegating, and conquering procrastination *Eating, exercising, and sleeping right *Stress-resistant thinking *Reducing interpersonal stress *Personal relaxation techniques *The top ten stresses in life *The ten most stressful jobs With a wide but manageable array of stress-management techniques, strategies, and tactics, this is your own personal toolbox for stress relief. So relax, take a deep breath, and start reading!